I heard someone say this once... "where there’s a will....500 relatives will appear". That struck a raw nerve inside somewhere and hence I decided to write me a will with very SPECIFIC people in mind. Just in case you die of boredom reading it I’d suggest you make a will of your own right away. I, Shreyasi Majumdar aka Twinky, also known as The Bandit Queen among select circles, currently above 18 years of age (although I keep hearing otherwise), of rotund but otherwise sound body and what my friends claim to be a completely unsound mind, do hereby declare this to be my last will and testament (subject to as many changes as I can possibly make fervently praying that I have at least another 50 years to go!). 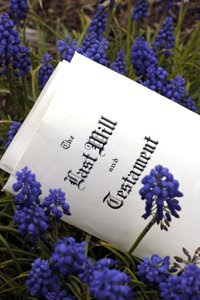 All other wills I may have made in the past (refer to small chits of paper lying scattered around my boudoir) or passed on through word of mouth (no wait...that parakeet died I think), are hereby rendered null and void. http://www.youtube.com/watch?v=fXJ9MgxXd2w that has worked wonders for me in my entire lifetime of perpetual sari-drape alzheimers...all the best! 3) To My husband, I leave all my clothes...keep them for a while, but please after three months or so give them to the salvation army or burn them...either ways don’t let the moths get to em! I also leave you my Harry Potter series (ahem!!! as of now you still have to buy me the fifth movie) and the Sherlock homes game, the Da Vinci Code game and the cake mania game cd’s...(you’ll need something cheesy to occupy yourself with now that Im gone)To my darling Sushil, I also leave the cook book I had written just before marriage...was all done for you sweetie...This book also comes with an extremely unorganized kitchen (I think a family of roaches has set up base behind the non stick frying pan on the second shelf...also Theres a box of payesh in the fridge which is growing green stuff...knowing me...itll be there till the day I die...so please put on your handy HAZ MAT suit and dispose it before it ‘gets you’. Also behind that there is a red box and I swear I saw it move the other day...so God help you with that)...whatever it is leave the lizards alone it’s their house too!!!! To Sush, I also leave my cycle...don’t know if that’s legally valid in this will since it actually belongs to you and you had just loaned it to me, but I thought I’d mention it anyways (professing self importance) since I wouldn’t want anyone else to have it...I also leave to you all my animation cd’s/dvd’s to remind you of the cartoon you once married (and if you want to forget that blasted incident just give them to Disha!) To Sushil I also leave my engagement ring and mangalsutra...do not...I repeat DO NOT cremate me with them on...the gold is wayyy too precious to be destroyed in a funeral pyre...I also leave you my Christmas lights, tree and trinkets, to remind you of how I used to light up your life and to also warn you that if another woman ever so much as comes near you, I will turn out both your lights for good...so there! Also I know you don’t put much stock in it, but I would like to leave you my SLAM book...it has many treasured memories from friends long gone...Please also treasure all the letters/ cards from my dad and mom, and especially the ones from you...only you know how much they mean to me so you’d be the best caregiver to the weathered memories. 4) To my grandparents, I leave you my best wishes for a happy after life, since I intend to live till 60 at least and I hope you have already reincarnated by then...it would be horrid of me to want you to stick around in this life just for me...so go on ... enjoy the rebirths! http://www.singaporebusinessdir.com/Employment-HR/maid-agencies/ once you have gotten over the unforgettable Kini experience, go get yourself an efficient maid to clean up after you, during your experiments in the kitchen with my cookbooks! J I also leave you my DVD “Walk away the pounds” by Leslie Sansone, although I’m hoping by the time this will is read, both you and I will be thin as reeds and won’t need the DVD. 10) To Wilson, my best guy friend, and back up boyfriend for all time, I leave you the little bamboo plant you sent me from so far away on valentine’s day...it was one of those special valentines days I won’t forget...I want to also let you know how much your friendship has meant to me all along...these things don’t pass away with a human body...and before I get mushier, would also like to leave you a punched up face, broken limbs and black eye for all the mean things you’ve said to me so far...halloa!...never mess around with a girl...especially a girl like me !!! oh and yes before I forget I would have liked to leave you something else ... only I don’t have it thankfully! ... a picture of BURT REYNOLDS(not the actor)...all framed and hung up on your front wall...to torment you for the rest of your life...cheers Willy! 11) To my “wild” friends, Rohit, Jeherul, Amar Deshpande, Archana, Abhijeet, Riten and anybody else I’ve left out, I leave you with a bright future...because knowing that people like you exist in this world gives me hope for a better world tomorrow. I also thank you for some wonderful times in the lap of nature that I was allowed to experience in your company. 13) To my old AIMS friends Ayesha, Amruta, Sanjay, Akashdeep, Zaid, Snehal , Prakash, et al, I would like to leave you’ll with the knowledge that you guys made a difference to my otherwise lonely childhood and I’m proud of the people we have become over the years. To Prakash especially I leave the “secret” technique you had shown me many many years ago to make brilliant decorations cut up from folded paper...I solemnly swear I have honoured that vow and never shared with anyone the childish pact made so many years ago. 14) To My SVPV friends, Sumi, savi, karnik, shabbir, yogi, zulu, pranay, anil, anshal, akshay, and all the rest of the gang...JAI HO! WE MADE IT PPL...although we did think SVPV would leave us stunted in growth as far as basic intelligence is concerned...we somehow made it...and therefore I leave you all with hearty congratulations for surviving “the school with more buses than students, worksheets and multi coloured PT uniforms” and more so for keeping in touch through the years...and lame as it sounds...I WOULD REALLY LIKE THAT REUNION BEFORE THIS STUPID WILL IS READ PPL!!! 16) To my Guns n Roses friends from Bhavan’s, Shruti and Jay, I leave you lots and lots of hugs and good wishes...you brought smiles into my life during a troubling and difficult time and for that I am eternally grateful. 17) To Kannan, I leave my brain...hopefully now u’ll realize it’s a miniature...please go to the life sciences department at Xaviers and ask them to preserve it for you...they know me...they’ll do it at a discounted price...after that you can shrink my head and display it as a monument to absurdity! 19) To Jane teacher I leave my undying gratitude for showing me what a teacher really is. 20) To the best boss I ever had, Russ Mc Culloch, I leave you best wishes for a happier, lighter (pls refer to the waxing deal) and carefree life (I think only voluntary resignation from SBB as ASIA Editor will aid the carefreeness J ). To all my other SBB colleagues, I leave a prayer for you for plain and simple happiness in whatever you do and wherever you go. You guys are the best bunch I’ve ever worked with and I thank you for silently enduring me all this while. 21) To Naeem and Vivek, the two people who have taught me whatever I know now of international trading, I leave my entire address book...stuffed with whatever contacts I have garnered over this time. Feel free to contact any of them and use my name as reference...(By the time this is read, they won’t be able to reach me...muaahahahahaha). 22) Lastly to my lawyer I leave this will, hoping that he is not comatose by the time this has to be read. For all other clarifications speak to the above mentioned lawyer who I’m hoping will outlive me....of course with global warming going the way it is, we may have no need for this will one way or another!